Built in Thane (West), Mumbai, Ashar Codename Golden Mile is a residential development by Ashar group. The project is sufficed with all modern amenities and covers 1BHK and 2BHK apartments. Being close to all necessities, it has good connectivity to the rest of the city. Codename Golden Mile is located from where day to day stores, Banks, Atms, Schools, College, hospitals are near by. 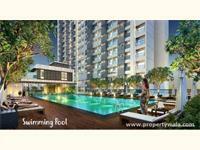 1 BHK for sale at HAPPY VALLEY ,THANE.